The official website of the Hello World original anime film revealed main cast members, a teaser visual (pictured), and a teaser trailer on Thursday. The film will open in theaters in Japan on September 20. Tomohiko Itou (Sword Art Online) is directing the film at Graphinica with script by Mado Nozaki (Seikaisuru Kado), featuring character designs by Yukiko Horiguchi (K-On!). 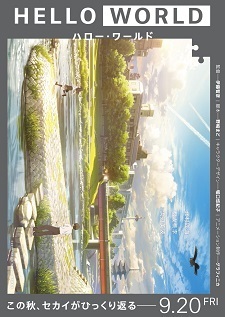 Hello World marks Itou's first directorial work for an original anime film. Takumi Kitamura (Haru Matsu Bokura live-action film) stars as the protagonist Naomi Katagaki, a shy 16-year-old high school student. Toori Matsuzaka (.hack//The Movie: Sekai no Mukou ni) also voices the same character, but his 10 years older future-self. Minami Hamabe (One Piece: Heart of Gold) will play the heroine Ruri Ichigyou, Naomi's classmate and a fellow library committee member. The film takes place in Kyoto in the year 2027. The teaser trailer features famous Kyoto sites such as the Fushimi Inari Taisha and the Kamigamo Shrine. The trailer suggests that the film will tell a time travel story, with the text "If I could redo that time all over again." I think it looks nice. The title remains me when i was a programmer. I was expecting something more cyberspace-styled. Anyway I'll need to see more. Time travel? That's a shame. I was hoping that it would be something about computers and programming. Hence, the famous words "Hello World." Thank God someone at least someone recognises how utterly crap Your Name is. You people are not alone..
Oh another anime from shinkai, I predict its mal score will be above 9 again just like Your Name because of votes rigging. Is it a programmers reference?! We have some great movies this year. This one looks interesting enough. Have you seen PV for children of the sea ? If there is reval for Makoto Shinkai's Tenki no Ko, It's deffinitely children of the sea. Can't wait, and I wonder why I am just learning of this now. Nah, Promare and Yuaasa movie exists.